Guillermo del Toro popped up at WonderCon 2013 to promote Pacific Rim, his upcoming Giant Monsters Versus Giant Robots movie, and while there he shared a little more with the crowd about his plans for a Justice League Dark film, featuring DC and Vertigo characters such as Deadman, Zatanna, Swamp Thing and Etrigan the Demon. Del Toro told the enthusiastic crowd that he has written the “Bible” for the film (a text laying out the various characters, their relationships, and the overarching story), but that a script has not yet been hammered out. According to reports from those present, del Toro expects to announce a screenwriter shortly. In addition, del Toro dropped a few tidbits of information about the project, which has been simmering for a few months now. In the film the character of Swamp Thing will have “found peace” with who he is, the character of Jason Blood (Etrigan the Demon’s human half) will have been a knight of Camelot, Deadman will be searching for the man who shot him, and the “origin” of the team in the film will be doled out throughout the film’s running time as opposed to front-loading it. According to del Toro, John Constantine will lead the film’s team of monsters and magicians, and the character “will have blonde hair,” unlike the version of the character played by Keanu Reeves in 2005’s Constantine. Del Toro will focus on his next film, the Gothic horror Crimson Peak, before turning his attention to Justice League Dark. A Justice League Dark film (previously known as “Heaven Sent” and “Dark Universe”) seems a perfect fit for a filmmaker with del Toro’s proclivities, as well as a smart bit of Marvel Studios counter-programming on the part of Warner Brothers. Where Marvel has been tailoring their films to appeal to the broadest possible audience, DC’s recent choices (Nolan’s Bat-films, Snyder’s Man of Steel) have indicated a slightly more “mature” sensibility may be Warner Brothers’ approach to distinguishing their films from Marvel’s. 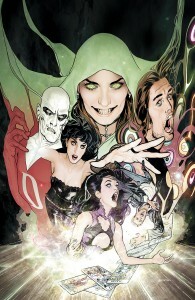 Justice League Dark has not received a green light from Warner Brothers, but indications are that Pacific Rim is a gigantic crowd-pleasing summer film and if it does well look for Warner Brothers to green light the ever-lovin’ bejeezus out of this thing. Someone bring me some concept designs this very instant, this film will look amazing! So excited for this movie, even if it is possibly the last nail in the coffin of Del Toro’s At The Mountains of Madness project. The director and material is a match made in heaven, or in this case, hell. (And that’s the very last of my puns). This project shows that their is still some smarts over at WB/DC. While their main properties are being held back for assessment post-release of Man of Steel, they can roll on forward with development on this movie and not worry too much about any continuity (lets face it, they are never likely to meet their Light counterparts on celluloid). The darker tone fits right in with the current mood over at DC, better in fact than most of the other properties they’ve been trying to develop for the last few years (Flash, Wonder woman, etc). That said, I can see Del Toro managing to bring a lot of humour and pathos to these characters, as well as the more mature palette.